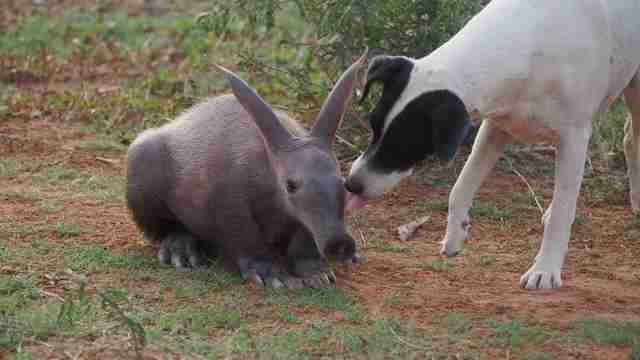 When Gertie the aardvark first arrived at ZURI Orphanage in Namibia, she was weak, dehydrated and covered in sores. She'd also lost her mom. 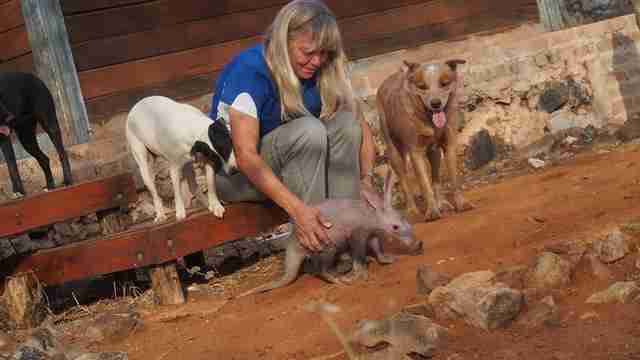 Thankfully, Erika de Jager, the orphanage founder, knew exactly how to care for Gertie. 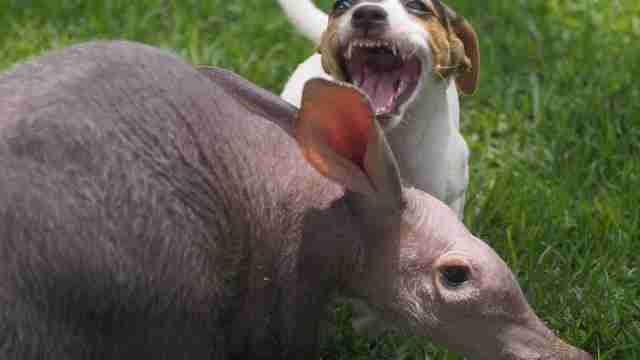 She bottle-fed the aardvark, and made her feel comfortable in dog beds so she could sleep as long as she wanted. 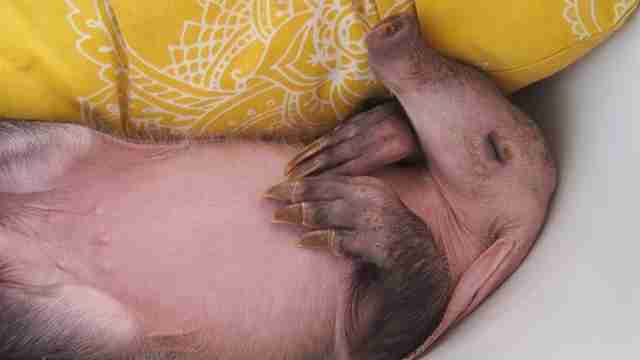 Aardvarks are nocturnal, but when Gertie was very young, she slept for most of the day and night. But Gertie's older now - de Jager estimates that she's 4 months old. She's still too young to be released into the wild, but she's getting more active and playful ... especially when de Jager is getting ready for bed. 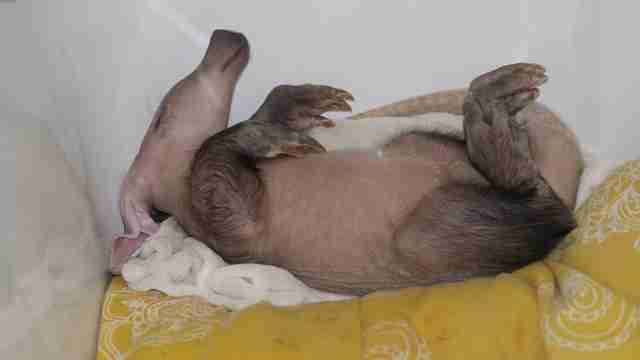 "Last night at 12 a.m. she decided it was time to play," de Jager tells The Dodo. "As I was trying to sleep, she stood up with her little feet on the bed. 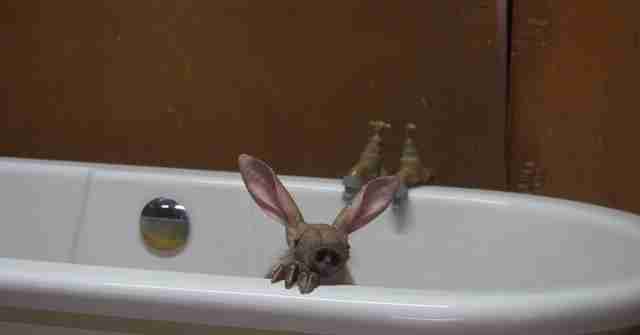 All I saw were these big ears." 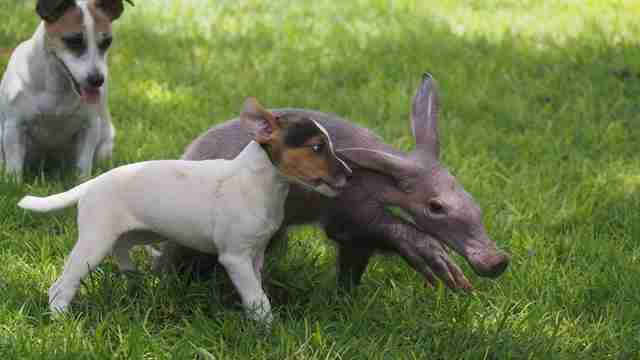 When de Jager does manage to get some sleep, she works as a veterinarian. One of her jobs takes her to a neighboring farm where she treats a couple of horses. Since Gertie's still a baby who needs constant supervision, de Jager brings her along. Gertie doesn't seem to mind these daytime outings, especially as she gets to play with the neighbor's Jack Russell terriers, Krummel and Zettie. "Krummel fell in love at first sight," de Jager says. "She didn't leave [Gertie] alone for a minute. She followed her around everywhere. 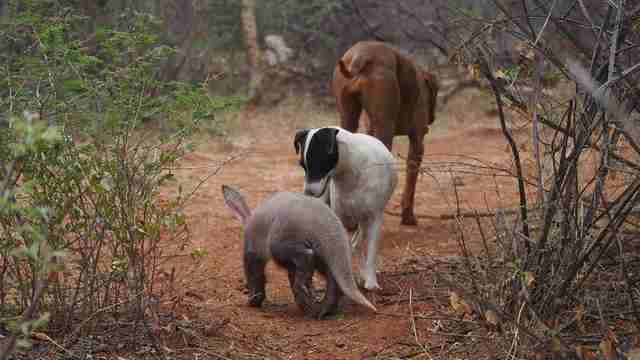 Sometimes dogs have a strong motherly instinct and will look after babies. I suspect Krummel is like this." Zettie, on the other hand, was a bit more standoffish. "She was a bit scared of Gertie," de Jager says. 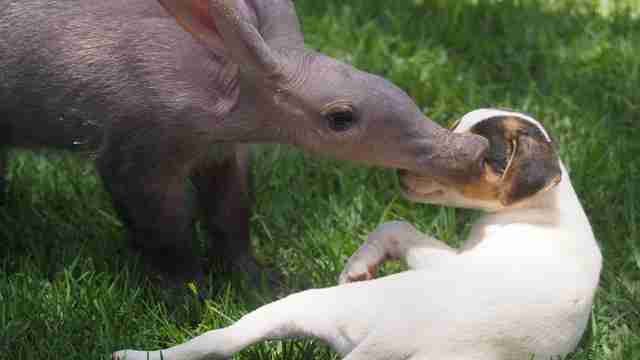 "But once she realized that Gertie was a great new friend, she was the happiest little puppy." Now Zettie just wants to play. And play. And play. And play. "Zettie will run and fall in front of her like puppies do," de Jager explains. Gertie also loves spending time with de Jager's dogs, Spokie and Zarah. "Gertie will follow Zarah and just walk with all the dogs," de Jager says. "They will often lick her and she will follow them." 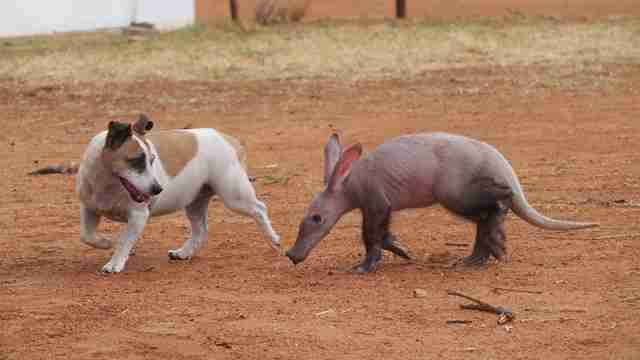 Gertie might only have dog friends now, but de Jager hopes she'll eventually meet other aardvarks in the wild. But for the moment, Gertie still has some growing up to do. "She's not even eating yet," de Jager says. "She still drinks out of a bottle. Gertie will be with us for still a long time. Even my staff are sad because she's growing so fast." No doubt the dogs will miss Gertie, too. 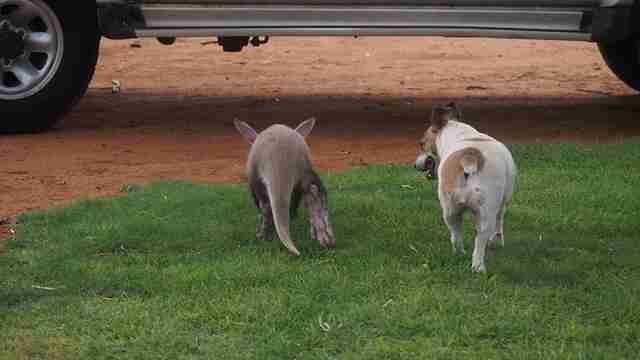 To follow Gertie's adventures, go to ZURI Orphanage's Facebook page. 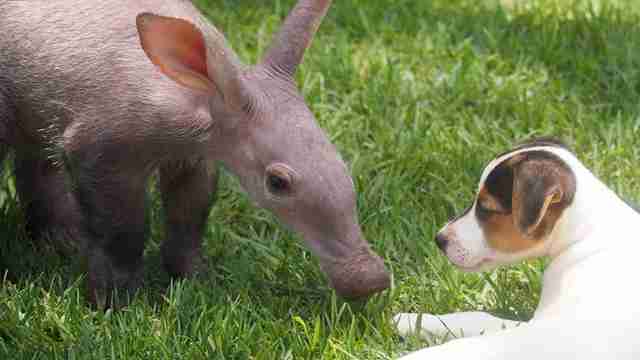 You can also help aardvarks and other African animals by making a donation to Zuri Orphanage here.